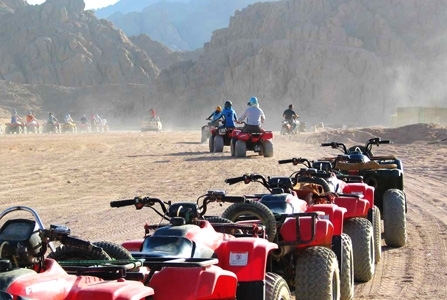 Combine adventure with dramatic desert scenery by experiencing Quad bike trekking and safari tours from Sharm el Sheikh Egypt , such a fun, adventurous way to explore the beauty of Sinai desert. Egypt Travel representative will pick you up from you hotel in Sharm El Sheikh to enjoy four wheeled fun. Drive your quad-bike out in the desert and enjoy the fabulous desert experience on quads seeing the beauty of the Bedouin life enjoying their tea unforgettable sun set or sun rise between the desert mountains of Sinai .